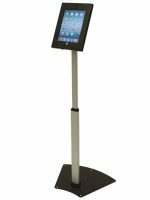 Freestanding iPad holder with adjustable height. 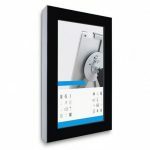 Wall mounted display to suit screen sizes from 22″ to 49″. Slim digital a-board with 32″ or 43″ screen options. 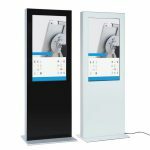 Freestanding digital totem with screen sizes from 32″ to 85″. Is it time to get digital? We think so! Get creative with your marketing messages with our range of digital advertising signs and screens. Digital signs give you the ability to display dynamic content. From seasonal messages to promotional videos – you can tailor your marketing messages as much as you like to suit different environments. 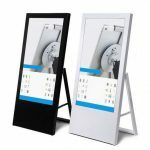 Looking for a touch screen sign? Or perhaps you’re looking for a display with your company branding? All this is possible with our range of digital signs. Find a sign that’s perfect for you or give us a call on 0808 231 8560 to find out more. How easy is it to upload content? All our digital signs are designed as ‘easy signage’ for our customers. Why ‘easy’? All that’s needed is to copy your media onto a USB stick, plug it in and turn the screen on. It’s that simple. It’s important to make sure your media is set up in the right format before uploading onto a USB stick. There are also other options available such as displaying a web page, which requires a slightly different set process. Please find out more detailed guides on the product pages. 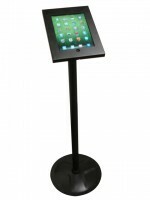 Need a digital screen included? We offer screen included options for our digital displays. These aren’t any household screens, and we do not recommend using these either. Screen included options use commercial LED Samsung screens specifically designed for long lasting retail use. Compared to household screens, they will not overheat over long periods of time. Commercial screens also feature high resolution and brightness specs, making sure your content looks fresh and eye-catching all day long. Still having trouble finding something that suits? We may be able to offer more custom digital signs for you. Give us a call and talk to a member of the team to find out more. Why choose us for digital signs? Most digital signs are delivered assembled – so all you need to do is plug in your media and you’re good to go! Sometimes it’s not that easy, and we understand this. That’s why you’ll always have a dedicated account manager to help you throughout every stage of ordering and setting up a digital advertising sign. Are you looking for something more custom? Or do you need more information? Please don’t hesitate to give us a call on 0808 231 8560 where a member of staff will be more than happy to help. Alternatively, use our live chat system during working hours.